Turkey is a staple of a traditional Thanksgiving feast, but let’s be honest: cooking turkey can be an ordeal. You’ve got to thaw the thing for days, properly prep it, cook it for hours, cut it up, and dispose of the waste. Oh, and somewhere in there you’ve actually got to find time to eat it. When you have a large crowd it can be worth the effort, but what about smaller groups, or when the time or labor isn’t practical or even desired? Sure, you can go with lower-maintenance entrees like ham (or, my personal favorite, steak), but what if you still want turkey? There are a few options out there. And Aldi’s got one of them. 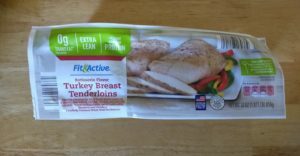 Fit & Active Rotisserie Flavor Turkey Breast Tenderloins come with two “perfectly seasoned” white meat tenderloins, boneless and skinless. The tenderloins are sealed in a marinade. The Aldi website says the cost varies by store; ours was $5.99, or about 20 cents an ounce for the 30-ounce (1.875-pound) bag. Nutritionally, the turkey is predictably low in fat and carbs, but it’s moderately high per serving in cholestorol (11% of the recommended daily allowance) and higher still in sodium (22% of the recommended daily allowance). The turkey has some modest benefit in calcium and iron, and we assume it does as well as a full bird in making you sleepy afterward. The turkey and marinade are gluten-free. The instructions offer three cooking methods: grill, bake, or broil. Grilling involves cooking the tenderloins for 20-30 minutes, turning every 5 minutes. Baking entails preheating the oven to 325 degrees, then baking the turkey in a pan for 50-60 minutes. Broiling, meanwhile, consists of placing the turkey in a pan 4 inches from the heat, then broiling for 20-30 minutes, turning every five minutes. In all scenarios, the turkey should cook to 165 degrees. We grilled it on medium, and it took about 30 minutes. We either rotated it 90 degrees or flipped it every five minutes, and we turned it up from medium to medium-high the last 10 minutes or so to finish the job. And … it was excellent. The turkey was tender and flavorful, with a bit of caramelizing of the marinade on the outside and a juicy interior. I like to salt my meats, but this turkey doesn’t need it; it’s got plenty of taste on its own without adding anything else. We’re not sure if it pairs well with a turkey gravy, but on its own merits it’s a win. If you like turkey and you’re looking for something simpler than cooking a full bird, this is worth a good look. 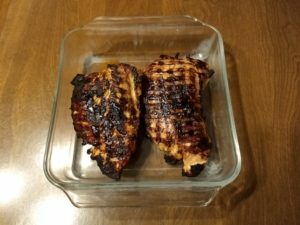 Keep in mind that it probably isn’t an exact substitute for a Thanksgiving turkey, since the marinade gives it a bit of a different flavor, but as far as turkey dishes go this is really good. Recommended.